Creating jobs for millions of youths coming out of institutes of higher learning and those in the rural areas still mired in unyielding agriculture is as important as pushing the economy ahead with respectable GDP growth each year. But over the years, while there the economy is picking up momentum with good show in the services and manufacturing sectors, the same cannot be said on the issue of employment generation which is lagging far behind in India. According to research body CRISIL, India would be in need of at least 5.5 crore additional jobs by 2015 to maintain the ratio of employed people to the total population at 39%. And this would be nearly twice the jobs created during 2005-2010. "If we take into consideration the number of people retiring or losing their jobs by 2015, new job recruitment has to exceed 5.5 crore and hence, achieving this will pose a great challenge without the necessary policy support," the report says. 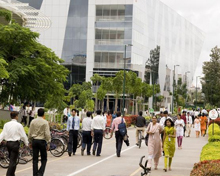 The CRISIL research study is based on the National Sample Survey Organisation (NSSO) data on employment in India. Total employment is the sum of people in jobs and self-employed. Between 2005 and 2010, the net addition in jobs was 27.7 million but the number of self-employed decreased by 25.5 million. This restricted the increase in number of employed people to two million. This increase has been misinterpreted by many as the number of jobs created. Even at 27.7 million, the job creation leaves much to be desired. Job creation has not kept pace with GDP growth. The GDP growth increased to 8.6% during 2005-10 from 6% during 2000-05, but the net addition to jobs remained flat at around 27 million during the two time periods. Combined with a decline in the number of self-employed persons, this sharply reduced the employment intensity (number of employed persons per lakh of real GDP) to one during 2005-10 from 1.7 in the preceding five years, according to CRISIL sources. The employment potential being thrown up by the faster growth in manufacturing and services could not be used fully due to lack of policy support. For instance, despite a faster growth in manufacturing, the employment declined by 7% in the absence of policy intervention. In services, employment slowed in financial and business sub-segments - a key source of jobs. In contrast, employment grew by almost 70 per cent in the construction sector. The trends in the employment scenario offer two specific insights to policymakers for accelerating job creation in the Indian economy. First, high economic growth alone is not sufficient for creating jobs as was evident in the last decade. Second, appropriate policies will have to complement high growth for facilitating the required job creation in the manufacturing and services. The role of government and its policy framework assume critical importance as poor growth in advanced countries is bound to affect job growth in export-oriented sectors of Indian economy. One way forward is to usher in labour reforms in the manufacturing sector and address supply constraints in services by providing skilled human resources in the job market through reforms in the higher education, points out CRISIL report. Employment in the organised sector turns buoyant with corporate houses aiming to create nearly 10 lakh new jobs and also announce pay hikes of up to 40% for best performers in 2015. With GDP growth rate being pegged at over 6.5% in 2015-16, after below 5% growth in the previous years, businesses across sectors are expected to grow and this should translate into more opportunities for jobs, according to experts. Moreover, India has a competitive edge of demographic dividend which would add to the hiring intensity to mark a new opportunity for creating jobs across industries. The job market in 2015 is expected to be in a strong hiring mode as companies are getting ready for steady recruitments across verticals. 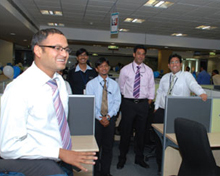 Besides, there are expectations that a large number of MNCs would set up their operations in India creating a lot of job opportunities at top management and middle-level categories. 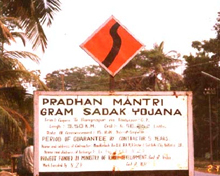 It was launched in April 1999 as a major programme for self-employment of the rural poor after restructuring the then existing Integrated Rural Development Programme (IRDP) and combining it with other allied schemes like TRYSEM, DWCRA, SITRA, GKY and Million Wells Scheme for effective implementation under a single banner called SGSY. The scheme was announced by the Prime Minister on 15 August, 2008 in his address from the Red Fort. This is credit linked scheme formed by merging erstwhile REGP and PMRY scheme. KVIC is the nodal agency at the national level. Its main aim is to generate continuous and sustainable employment opportunities in rural and urban areas of the country. MGNREGA guarantees 100 days of employment in a financial year to a rural household whose adult members are willing to do unskilled manual work. This Act is an important step towards the realisation of the right to work. It is also expected to enhance people's livelihood on a sustained basis, by developing the economic and social infrastructure in rural areas. This scheme came into effect on 1 December 1997 with an aim to provide gainful employment to the urban unemployed and under-employed poor by encouraging them to set up self-employment ventures. The government has launched this rationalised SJSRY to replace the three existing schemes -- Nehru Rozgar Yojana (NRY), Urban Basic Services for the Poor (UBSP), and PM's Integrated Urban Poverty Eradication Programme (PMI UPEP). 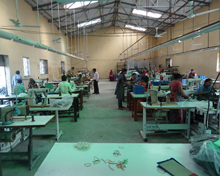 The scheme comes under the authority of the ministry of rural development and was begun on 25 December 2000. The goal was to provide roads to all villages (1) with a population of 1,000 persons and above by 2003, (2) with a population of 500 persons and above by 2007, (3) in hill states, tribal and desert area villages with a population of 500 persons and above by 2003, and (4) in hill states, tribal and desert area villages with a population of 250 persons and above by 2007. Launched in 1999-2000, this is a comprehensive housing scheme with a view to ensure the integrated provision of shelter, sanitation and drinking water. The basic objective of SAY is to improve the quality of life of the people as well as the overall habitat in rural areas. PMGY was launched in 2000-01 in order to achieve the objective of sustainable human development at the village level. The PMGY envisages allocation of additional central funds to the states for basic minimum services in order to focus on certain priority areas. PMGY has five components, namely primary health, primary education, rural shelter, rural drinking water and nutrition. SGRY was launched in September 2001 by merging the erstwhile schemes of Jawahar Gram Samridhi Yojana (JGSY) and Employment Assurance Scheme (EAS). The objective is to provide additional wage employment in the rural areas and food security, along with the creation of durable community, social and economic infrastructure in rural areas. The SGRY is open to all rural poor in need of wage employment and desire to do manual work. Rural housing schemes such as Indira Awaas Yojana (IAY) aim at providing dwelling units, free of cost to the poor families of the SCs, STs, freed bonded labourers and also the non- SC/ST persons living below poverty Line (BPL) in the rural areas. The scheme is funded on a cost-sharing basis of 75:25 between the Centre and states. AAY was launched in December 2000. Under the scheme, one crore of the poorest among the BPL families covered under the targeted PDS are identified and 25 kg of food grains were made available to each eligible family at a highly subsidized rate of Rs 2 per kg for wheat and Rs 3 per kg for rice. This quantity has been enhanced from 25 to 35 kg with effect from April, 2002. Launched with effect from 1st April, 2000, it aims at providing food security to meet the requirement of those senior citizens who, though eligible, have remained uncovered under the national old age pension scheme (NOAPS). The scheme is targeted to cover 20% of persons eligible to receive pension under NOAPS. Funds are released to the food and civil supplies department of the state governments in one instalment. This department ties up with Food Corporation of India (FCI) to release food grains district-wise after payment at central issue price (CIP) at FCI offices. VAMBAY was kicked off in December 2001 targeted to improve the living conditions of the urban slum dwellers living below the poverty line without adequate shelter. The scheme has the objective of facilitating the construction and up-gradation of dwelling units for slum dwellers. Besides, it offers a healthy environment through community toilets under Nirmal Bharat Abhiyan, a component of the scheme. The Centre offers a subsidy of 50%, the balance 50% is arranged by the state government.